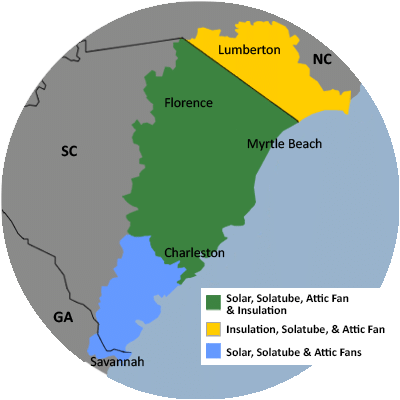 For a FREE no-obligation estimate in Green Sea, SC, please fill out the form to the right and Carolina Energy Conservation will contact you shortly. Would like to get an estimate on crawl space insulation. Significant moisture problems. We specialize in a variety of services aimed to lessen your home's carbon footprint and save energy and money each month! We offer it all, from air sealing to ductwork to insulation and HVAC services in Green Sea, SC. For a FREE, no-obligation services estimate in Green Sea, SC, you'll also receive a free copy of "Saving Energy and Money at Home," a great book to use as you begin to create a more comfortable, healthy, and energy efficient home! The racking system that is used during installation makes it easy to install panels on many different roof types, including metal!